January 27, 2011 - The fifth and final Gulfstream G650 flight-test aircraft took to the skies on Monday, flying for 2 hours and 46 minutes. All five aircraft that are part of the flight-test campaign have now entered the program. Serial Number (S/N) 6005 launched from the Savannah, Hilton Head International Airport at 12:07 p.m. local time with experimental test pilots Bill Dobbs and Al Moros at the controls and flight-test engineers Heather Burke and Nathaniel Rutland in the cabin. The aircraft reached a maximum speed of Mach 0.94 and a top altitude of 51,000 feet (15,545 m) before landing at 2:53 p.m. local time. The high Mach number was achieved to validate the aircraft?s maximum speed for stability characteristics, a requirement for receiving a Certificate of Airworthiness from the Federal Aviation Administration (FAA). Such high speeds are outside the aircraft?s normal flight envelope. The G650?s maximum allowable Mach number is Mach 0.925. Throughout the flight, the crew evaluated the aircraft?s avionics, flight-control systems and handling qualities. ?This flight represents a significant milestone in the overall certification program,? said Pres Henne, senior vice president, Programs, Engineering and Test, Gulfstream. ?We?ve had four aircraft flying for some time now, so we?ve already accomplished a broad range of tests. In addition, the fatigue test article has moved to the structural-test hangar, where it will be used to evaluate the lifelong structural integrity of the aircraft. The flight-test program is moving along at a brisk pace.? Before its first flight, S/N 6005 underwent certification ground tests for lightning and high-intensity radiated fields (HIRF). Performed at the company?s headquarters in Savannah throughout November and December, the lightning test indicates the airframe and systems can withstand a severe lightning strike, while HIRF testing demonstrates the ability of the aircraft?s flight-essential systems to withstand external radio frequencies without interference. The four other aircraft flying in the test program have also completed several tests required as part of the G650?s certification by the FAA and European Aviation Safety Agency (EASA) later this year. S/N 6001, which flew for the first time on Nov. 25, 2009, has completed the initial flight control system (FCS) certification test, which covers handling qualities under backup flight-control mode. This includes handling qualities at low and high speeds, as well as operations under electric backup. The aircraft also completed company tests for minimum control speeds in the air and on the ground. ?Minimum control speeds are equal to or better than predictions,? Henne said. Focused on the engine and the auxiliary power unit, S/N 6002 joined the flight-test program on Feb. 25, 2010. Since then, the company has completed tests of the aircraft?s engines and systems under negative g-force conditions. Flight-test engineers have also completed initial field performance tests, including brake-control optimization and assessing the VMU, or the calibrated airspeed at which the aircraft can lift off. S/N 6003, which made its flying debut in May 2010, is undergoing development tests for the aircraft?s anti-ice system. It?s also in the midst of avionics tests for the latest PlaneView II software. This includes assessing the aircraft?s cockpit displays, communication, navigation, recorders, terrain awareness and warning system (TAWS) and enhanced ground proximity warning system (EGPWS). This aircraft also successfully completed flyover noise certification tests, conducted jointly with FAA and EASA specialists. S/N 6004, which is the first Gulfstream flight-test aircraft to include a fully outfitted interior, remains focused on tests of the cabin systems, including water and waste systems, operations under extreme cold-soak conditions and Type Inspection Authorization tests of its communication radios. Additionally, crews have completed an initial evaluation of cabin temperature control and performed preliminary cabin noise surveys. 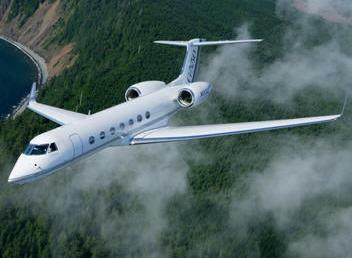 The five G650 aircraft have now surpassed 1,100 hours in their flight-test program and are on schedule for certification in 2011 and first deliveries in 2012.